Although cataclysmic events typically become the stuff of Hollywood blockbusters and cable news, Kondo Kenichi is interested in how contemporary artists learn from, comment on, and even ameliorate the negative effects of such twenty-first-century disasters as 9/11 and the 2008 economic crisis. 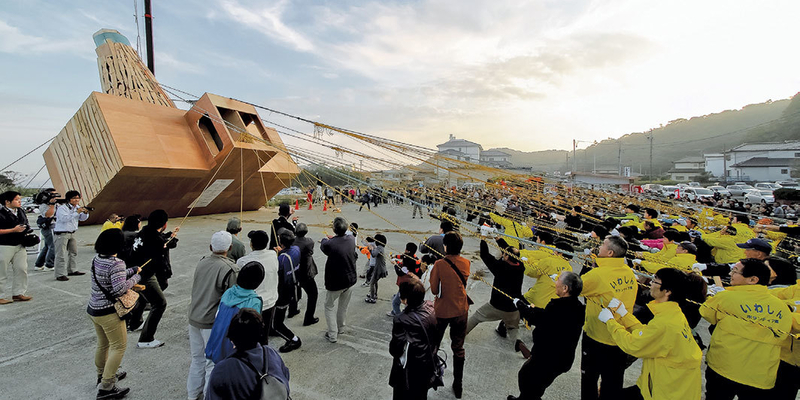 Crucial to his thesis is the artistic response to Japan’s 2011 earthquake, tsunami, and nuclear-plant meltdown, a tripartite calamity that spawned Tsubasa Kato’s The Lighthouses–11.3 Project, 2011, a social sculpture requiring five hundred rope-pulling volunteers to raise a wooden mock-up of a destroyed Fukushima lighthouse. Eva and Franco Mattes, together known as 0100101110101101.org, will show a video of an eccentric playground ride constructed from decontaminated metal parts from Chernobyl. Other adversity-inspired contributors include Yoko Ono, Swoon, Akira Tsuboi, and Thomas Hirschhorn. “That things just go on” is how Walter Benjamin famously defined catastrophe. With more than forty recent videos, installations, paintings, and sculptures, plus a catalogue, Kenichi’s exhibition will test that supposition.